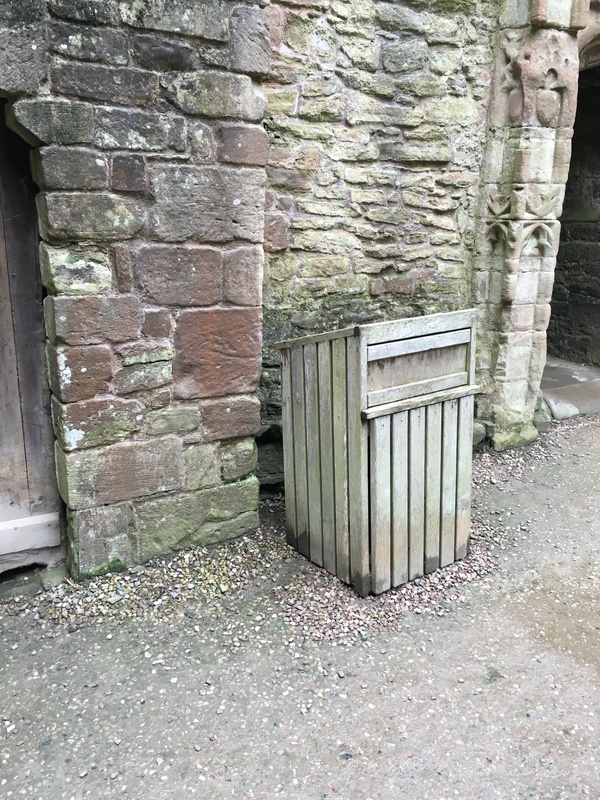 As you may have realised, Wordpretzels, I am fairly renowned as a globe trotter and I took the opportunity this week to add to my experiences by taking a trip to Ludlow, Shropshire, with Lady Barton St Mary, The Sexton and Pen. Fortunately, The Sexton and Pen had been to Ludlow before, so any issues with the locals concerning currency and language barriers were pretty well covered. The journey wasn’t too onerous, although I was gracious enough to give up the front seat to Pen for the journey and sat in the back with The Sexton. “Looks like the weather will be fine today,” I commented. The Sexton sucked thoughtful tooth. “Arr. But remember, the sun never shines in the pub,” he replied knowingly. 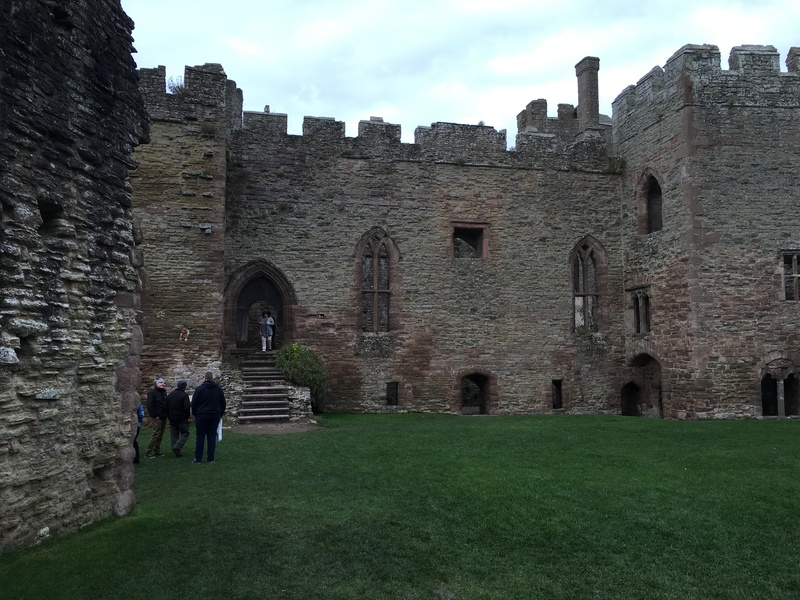 Ludlow has a Castle, rather grandly referred to as a ‘Norman Citadel’. We paid a fiver each to have a look at it. It was built during the 11th century by Walter de Lacy, who must have been a hell of a bricklayer, since there’s loads of it. It was then owned by the Mortimer family, who came over with William the Conqueror. By the 13th century they had quite a reputation for killing royalty and even had a stab at getting the throne themselves. “I know the Mortimer family, “ said The Sexton, peering at an information board. It became apparent fairly quickly that the castle had seen better days. To be fair, it had seen better days in 1689. Put it this way, the dodgiest estate agent would struggle to put a positive spin on this place. ‘Has potential’ doesn’t even cover it. The leaflets claim that it has been renovated, but I must admit the builders haven’t done much. There’s a few roofs missing, and no glass in any of the windows, let alone low maintenance uPVC frames. 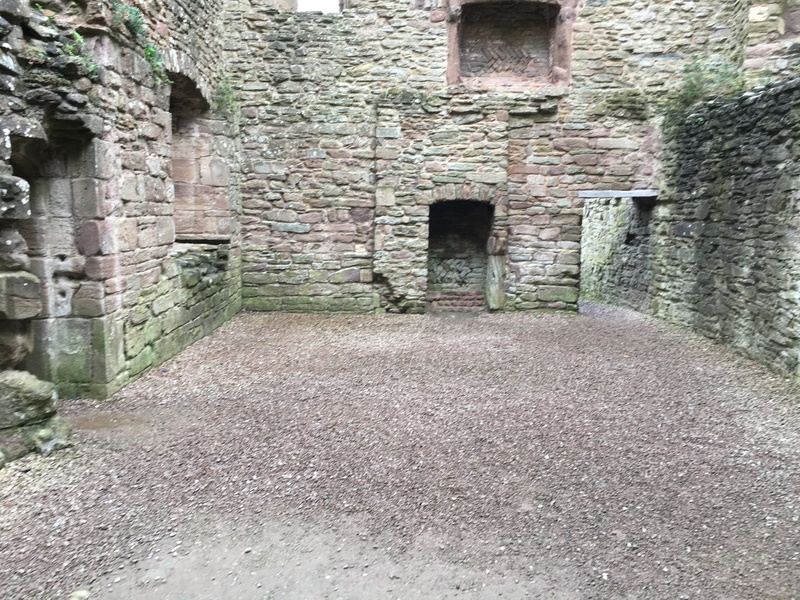 This is one of the big halls of Ludlow Castle, where people gathered in the 12th century to watch battles on the big screen hanging over the enormous fireplace. 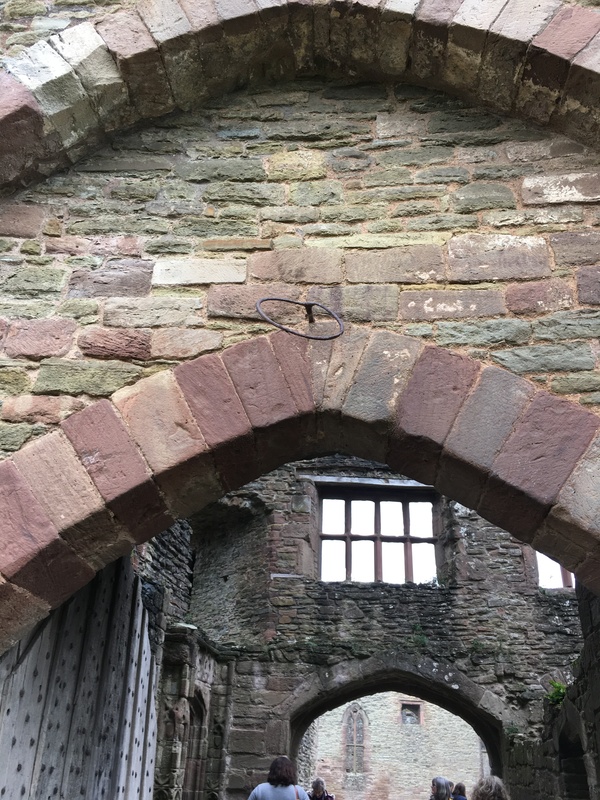 (Right) As you enter Ludlow Castle across the drawbridge, your eyes are drawn to the medieval basketball hoop that has managed to survive the centuries. Many of the soldiers involved in the civil war enjoyed playing a few hoops before going into battle. Basketball was invented in Ludlow in 1254 by Lord Meadowlark; his descendants went on to form The Harlem Globetrotters in America. As you can see, Judges in the olden days were much hardier than they are now, preferring gravel to shag pile carpet. Providing they made it through the auditions, this is where hopeful minstrels stayed for their ‘boot camp’ trials in the 13th century, before either going through to the live finals or being ‘voted off’ (beheaded). (Right) A well preserved example of an individual prison cell, probably built around the time of the birth of Bruce Forsyth in 1418. Food and water was posted through the large slot in the front, whilst a small hole in the back allowed the prisoner to take his ease. Probably. The castle experience was a fun filled 45 minutes, including walking across wet grass in my brown leather shoes and a quick look around the gift shop, where Pen resisted buying some medieval plastic jewellery for Christmas. By this time, The Sexton was ready for a coffee, or as he likes to call it, a beer. Lady Barton St Mary, something of a culinary bloodhound, led us to The Green Café, where we decided to have a simple drink and perhaps a slice of cake before heading into downtown Ludlow. The simple drink included a salt beef sandwich, a beer and some cake. Very nice it was too, sitting by the river, filling our faces with delicious food and willing the children skipping across the rocks in the water to fall in. Sated, we headed for the action. Ludlow, it appears, is famous for eating and charity shops. Lots of them. So many, that heady, musty smell associated with such establishments is almost tangible. There is also a proliferation of clothes shops, all selling jackets, shirts and trousers which can only be described as “Young Country Tory Chic.” The sort of stuff you either see worn by old Etonians in Cirencester or by farmers’ sons and rural workers in the village pub. Visitors to downtown Ludlow seem to fit a certain demographic in age terms. Certainly, they travelled with their children, but in this case their children were all in their sixties. Observing the residents of The Feathers Hotel, their ages ranged between 84 to 145 years old. The Feathers also displayed full Christmas decorations in October, much to the amusement of Lady BSM. I can only surmise that time passes so quickly for the typical guest that the hotel had decided to keep the decorations up all year around. However, despite their seniority, the ladies seemed to like the sporty look which usually encompassed running tights, a pink/purple lycra top, trail shoes and a walking stick. One lady had a pair of running shoes that were far better than mine. On our final shopping trip for the ladies, The Sexton asked the assistants their recommendations for dinner. Bistro 7 was the place, they explained, which it certainly was, since the rather surly maître de told us they were full up when we arrived there. Whilst considering our gastronomic options, we had a quick drink in The Bull Hotel, where we were greeted with silence and a stare upon entry. I half expected a pianist in the corner to stop playing and painted ladies to gather their skirts and head for upstairs. However, we were served without having to send The Sexton out for a duel, getting the hotel special, which was a quick rub round the top of your glass with a damp, ancient tea towel to ensure that special musty smell when you took a sip. We didn’t complain, just in case the sheriff turned up, took our guns and shoved us in the cells for the night. We made a wise decision and enjoyed a very nice meal at The French Pantry, where we found out what a civet was and shared a joke with the other diners who were regular visitors to Ludlow. In fact, they’d been coming since the castle stopped taking guests in 1612. With full bellies and warm hearts, we spilled out onto the deserted streets of Ludlow; it was nearly half past nine, which is the middle of the night in Ludlow. The Sexton thought it wasn’t that unusual when you considered it; most visitors and hotel residents would have settled by 6pm and been in bed by 7.30pm. So, with Ludlow now officially closed for the night, we joined the small crowd of middle aged people back to the car park and headed for home, The Sexton explaining he’d have to prepare for the following day’s work. “What do you have to prepare to dig a grave?” asked Pen. “Well, I have to sharpen my spade,” replied The Sexton. This entry was posted in age, ageing, blog, blogging, blogs, Christmas, comedy, comic characters, friends, humor, humour, Lady Barton St Mary, life observations, Ludlow, Pubs, The French Pantry Ludlow, wordpress and tagged blog, blogging, comedy, comedy characters, comic characters, humour, Lady Barton St Mary, life observations, Ludlow, The French Pantry Ludlow, wordpress. Bookmark the permalink.